England has a wealth of pinks, especially fragrant ones. Whetman Pinks from Devon bred this new variety with all the charm and fragrance of a historic variety. Quaint pink and white striped 2" double flowers have a wonderful spicy clove scent and bloom atop strong stems and silvery blue foliage. Often reblooms in fall. This summer-long bloomer can be set in the ground in spring when there is still the possibility for a light frost. It can also be planted in early autumn. Pinks are longlasting cut flowers and are right at home along border edges, rock gardens or edging a stone or gravel pathway. They attract butterflies and bees and deer keep away. If applying mulch, keep away from the crown of the plant to avoid crown rots. Winter killed stems can be pruned away in springtime. Divide every 2-3 years to renew vigor—in early spring for zones 6 & 7 or fall in zones 8 & 9. Watering Details: Water regularly during first growing season: about 1" per week should do. 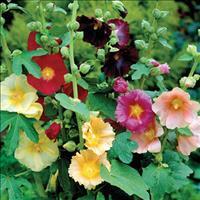 Once established, only need to water during especially prolonged dry periods. Soil pH: Tolerates most soil pH levels, but neutral to alkaline is preferred. If soil is particularly acidic, apply a handful of lime when planting. Plant: Compact 1' tall by 1' wide mounds of bluish silver, grass-like foliage. Flowering: Masses of pink and white striped double carnation blooms on sturdy stems above the foliage; each flower is about 1" wide with a spicy scent. Deadhead to prolong blooming. The genus name Dianthus comes from the Greek words "dios," meaning heavenly, and "anthos," meaning flower.